Darcy at My 3 Boybarians is doing this divine series at her blog on 31 Days to a Better Photo. She's only on day 10 and I already want to send her a fruit basket. For those of you who want to speak the same language as your DSLR camera, then this is just what the photographer ordered. She explains (in simple hooked on phonics instructions) things like metering, exposure triangles and other photo things that normally make me furrow my brow. Lots of new shows on the box this Fall and there's one I already want to hug more than any other. Raising Hope is about a 23-year-old who must raise his infant daughter with the help of his flawed family after the baby's mother (who's killed several boyfriends) is given the death penalty. Just like the Huxtables, right? It really is a sweet and endearing comedy. Plus Martha Plimpton, from Goonies and River Phoenix-girlfriend fame is crazy good. I've provided you with in-blog access to the 3rd episode, Dream Hoarders. You can watch more full eppy's at Hulu.com. I've already professed a love for singer/songwriter Cindy Morgan. 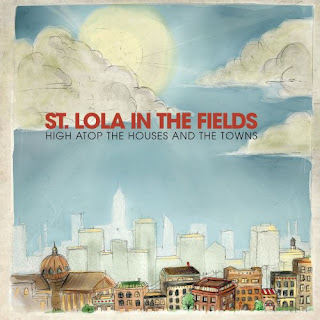 She's now embraced her married name, Brouwer, and joined Jeremy Bose to form St. Lola in the Fields. Their music's been featured on One Tree Hill and Pretty Little Liars. But you too can enjoy it without indulging in teen angsty drama. Their newest album is High Atop the Houses and the Towns. As of this second, you can stream the album in its complete loveliness at AbsolutePunk.net. Might I suggest a download of "Don't Say" and "Fix?" I just watched the pilot of Raising Hope last night. Pretty dog gone funny I must say. How have I missed Raising Hope? Oh my gosh that is classic!! j: It's rare for me to re-watch anything, but I've rewatched these at least twice and laughed outloud again and again. R: Me too! She really is even snazzier now!